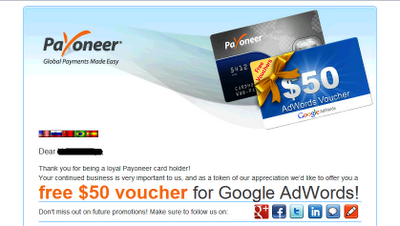 I’ve recently received an email from Payoneer.com containing a coupon code for a free $50 Google Adwords credit. So I tried the code by launching a campaign and of course it works! Are you one of Payoneer.com’s customers who have also received the same promotional gift? It was supposedly for loyal customers as a token of appreciation. But I’m guessing that it was randomly sent to lucky customers picked through some automatic formula. The “loyal” part doesn’t really count I’m sure. I know for a fact since I’m not really a loyal customer. I’ve only started using the Payoneer debit card recently and have used it for numerous occasions only. Too few that I can still recall each transaction one by one. 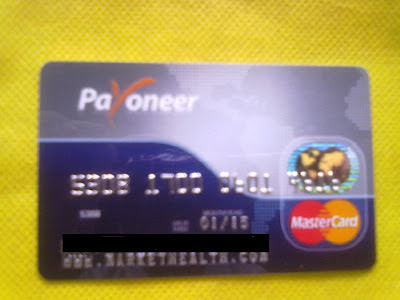 The card was originally intended for the Market Health Affiliate Program because their payouts are sent through Payoneer. I don’t quality for PayPal payments unfortunately; otherwise, it would have been a lot easier. The Payoneer MasterCard debit card is also applicable for other companies online including freelancing sites. There is a specific card allotted for other companies though. The site it is intended for shows at the lower portion of the card. See mine below. It shows www.markethealth.com (Related article – Make Money with the Market Health Affiliate Program). Going back to the $50 Google Adwords credit, I have no idea how to use it actually. I’ve never started any advertisement project using Adwords. The most I’ve worked on is a Facebook ad. Comparing these two platforms, Facebook Ad is definitely so much easier. You just have to create your ad and that’s it. No need to worry about keywords and bidding. For more details on starting a Facebook ad campaign, including how you can save on costs, read this article – Facebook Ad for Your Site, Blog, or Page. As for the very first Google Adwords campaign I’ve created, I’m not really expecting anything from it. I really have no idea how it works. I simply followed the instructions until it was done. I meant to create as many ads pointing to various articles as possible, but everything was just too meticulous I gave up after building two ads. As of the moment, I’ve just paused the other campaign and focused on one alone. The ad redirects incidentally to an article submitted for a contest. The competition involved SEO, meaning that the article should rank well for its targeted keywords. The Google Adwords campaign will help improve the article’s visibility through sites where the ad is displayed at. During the first day or so of the campaign, there were no clicks generated and there was minimal impressions achieved. A Google Adwords support agent contacted me through a welcome email and made recommendations as to how I can improve my campaign. Unlike Facebook where you simply choose between a click based or impression based campaign (please refer to the article on Facebook ad above for more details), Google Adwords will have you competing for other advertisers for your chosen keywords. The more highly sought a keyword is, the more expensive it becomes. My campaign wasn’t generating anything useful because my chosen daily budget as well as the maximum CPC or cost per click are both minimal. As per the recommendation of the Google Adwords representative, I’ve edited the campaign and increased both maximum CPC and daily budget. Right after that, the ad started to generate clicks. With conversions showing a promise, the budget might soon be spent and I may have to consider whether or not to continue the campaign at my own expense. I’m still no Google Adwords expert but I’m learning it and I will soon be. For now, let me say thank you very much to Payoneer.com for the free $50 Google Adwords credit! Thank you for leaving a comment. More power to Payoneer.com! Thank you for Nice Post M.M.M and Nassim ,Thank you for always provide best Support.